I can trace my thoughts about a sub-4 minute mile all the way back to middle school. Just starting my running career, I had no idea the challenge and work that lay before me, but I was extremely optimistic. From eighth to 10th grade I weighed less than 100 pounds. I was cut from my middle school baseball, and basketball teams with the coaches saying, "You need to grow a little taller." "You need to get stronger." Those two statements hurt, especially the "growth taller," because there wasn't anything I could do to speed the process. Then I found my home in track and field, a place where size didn't matter. In eighth grade, I mustered a 5:29 mile, in ninth 4:59, and by 10th grade I got it down to 4:50. I was on my way. I worked hard did everything I was told to do, always telling myself I was going to be good when I was older, stronger, and possibly after that "growth spurt." The race at Sir Walter Miler was an amazing experience, and for me it was a complete shock because 36 hours prior to my race I had a 24-hour stomach bug. I went for a shakeout Thursday morning thinking just some fresh air and increased blood flow might do my stomach some good. Arriving back at my house, I immediately felt worse and proceeded to vomit and then curl up in a ball on my couch. I had myself convinced I wasn't that sick – that I had simply eaten something that didn't agree with me, and that I would feel better once I rested. 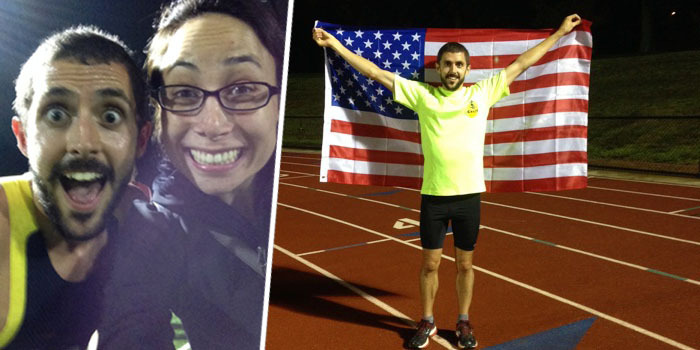 I went to work at Crazy Running, a kid's track and field organization that I co-own. After half a day, my business partner sent me home. At this point, all I had eaten was a banana and a few crackers, which I washed down with a sports drink. That night my girlfriend helped me write an email to the race director saying I wouldn't be at the pre-race dinner. We then went to the grocery store to get some tomato soup and bread. I ate as much as I could tolerate before heading to bed for 12 solid hours of sleep. The next morning (12 hours before the race) I was feeling well enough to eat breakfast and make the 2-hour trip over to Raleigh, with my girlfriend driving, of course. We stopped along the way for lunch; though still squeamish, I managed to eat something. For the rest of the trip, we battled traffic and rain, and I drifted in and out of sleep. After arriving at our host family's house, I laid down for a nap once again. My phone alarm went off 2 ½ hours before the start of my race. I got out of bed and into my racing gear…thinking I will at least warmup for the race, see how I feel, and then make a decision to race or not. While on my way to the track, it was hard to tell if I had typical pre-race nerves or if my stomach was still uneasy. The temperature was perfect; there was a slight mist in the air and no wind. After 15 minutes of warm-up, my legs felt rested and strong. My strides felt smooth but a little slow; I decide that I feel good enough to give the race a shot. My initial goal was to make it through 800 meters on the pace, to put myself in the lead pack. I left my sweats on until the last minute. I did one stride on the home stretch to test my legs. A crowd was gathered around the track in anticipation. I could feel their energy and excitement. The field lined up. I was in placed in lane one, which meant that I needed to get out a little quicker to ensure that I didn't get boxed in. The gun went off. I got a clean start and settled into fourth position. Lap one felt very comfortable, as we passed the quarter mile in 58-59 seconds. It felt like the crowd was right on top of us. Surprisingly, I felt pretty good as we moved down the backstretch. Guys were getting antsy, and one runner moved by me on the inside while another runner passed me on the outside. We came down the homestretch and passed 800 meters at 2:00 and the crowd grew louder. The pace surged heading into the final lap, and the pack broke up. I made a conscious decision to keep contact with the leaders. Coming down the homestretch for the bell, a few guys made aggressive moves, and I felt like how a rider in the Tour de France must feel when riding through a gauntlet. I tried my best to stay relaxed and keep contact as I saw 2:59 at 1200 meters. I thought to myself, "If I can run a 60 second lap, then I will break four minutes.... I just need to race!" I moved from fourth to third place down the backstretch, and with 200 meters to go, I decided to go for the win. I moved into second place in the final turn with 1,000 fans screaming, clapping, and slamming their hands on the track, yelling "GET IT, GET IT, GET IT!" As we raced to the finish line, my back tightened up, and my glutes were screaming. It was so loud I couldn't hear my thoughts. 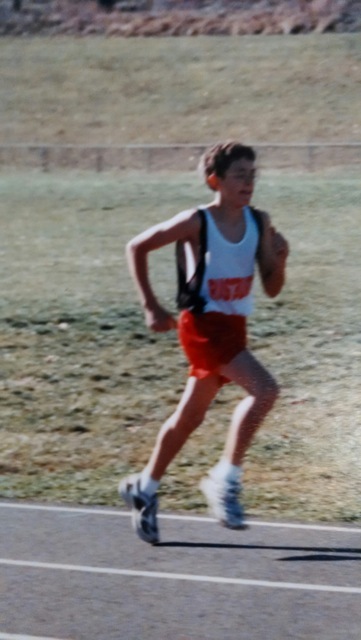 As I hit the line, I looked over at the clock as it ticked from 3:57 to 3:58, and I immediately threw my arms up realizing I had just broken the 4-minute barrier, 15 years after that skinny kid stepped onto the track in eighth grade.